For a Few Dollars More, Sergio Leone’s sequel to his own A Fistful of Dollars, helped cement the popularity of the spaghetti western to which his previous film gave birth. It’s a wacky and irreverent film, exactly the type of cheeky genre fare that you’d expect as the follow-up to a blatant act of plagiarism (A Fistful of Dollars famously lost a copyright infringement case to Toho, the company that owned the rights to Yojimbo), but all the more entertaining for its disrespect to tradition. Leone’s films helped revitalize the western genre, and they did so by taking the self-seriousness the genre had become associated with and throwing it in the garbage (along with the help of Ennio Morricone’s immortal, soaring score and the gorgeous widescreen Technicolor cinematography). This rebirth required some impertinence for cinematic history, and it shows on screen in the form of a unique and unmistakable sense of humor and air of cool. This irreverence is what makes the film fun, but it also never stops it from being intelligent. 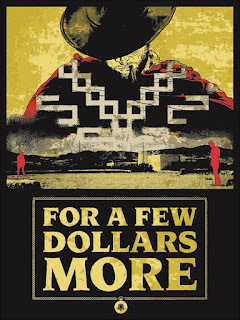 Like its predecessor was to a slightly lesser extent, For a Few Dollars More is a film about the value of life (often literally and monetarily) and the cost of our connections with other human beings (specifically men in this predominantly male society). 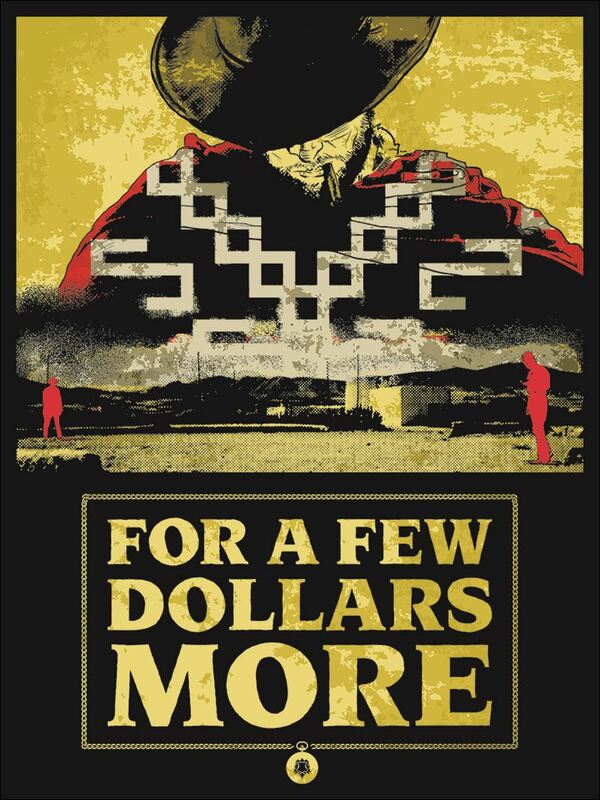 As For a Few Dollars More opens, we see a vast landscape with a single cowboy riding on horseback. We hear whistling on the soundtrack—a human sound, diegetic, coming from within the movie rather than the soundtrack—and then suddenly the cowboy is shot. This initial violence grounds the film as one framed through the gaze of a killer, a distorted and stylized perspective which is not quite reality, but not quite fantasy either. This is a film about the price of life from both the perspective of the killer and the victim, as in, "I’ll kill a man for A Fistful of Dollars, but I’ll kill his whole crew For a Few Dollars More." After the cartoonishly crooked opening credits finish, we see Colonel Douglas Mortimer (Lee Van Cleef) disembark from a train and witness a wanted poster for one Guy Calloway. The poster offers a $1000 reward, but two additional zeroes have been drawn onto it. The teller at the station explains that Calloway came by, saw the sign, and decided that his life was worth more than a measly $1000. This revised $100,000 reward is comically exaggerated, but it’s also the largest value we hear placed on any life throughout the rest of the film (and by a large margin at that). Like Calloway, we all value our lives at more than they could really be worth. Throughout the rest of the film, various characters are each pinned with their respective price tags. The Man with No Name (Clint Eastwood, here known as "Monco") kills a poker player named Cavanagh for $2000. No Name and Mortimer both hear of a bounty on the head of El Indio (Gian Maria Volonté) for $10,000, as well as smaller bounties for each of his men. After the two eventually join forces, there’s a scene where they list off the prices being offered for each of El Indio’s men. In this proto-capitalist society where money is the ultimate motivator (even the little boy who offers No Name information asks to be paid), life becomes objectified, quantifiable down to the dollar. The way to escape the flattening effect of this monetization of human life comes in the form of interpersonal connection. The film is filled with a wide variety of friendships, brotherhoods, and other communities: there’s the central pairing between No Name and Col. Mortimer, the triangle these two form with Indio (each occasionally appearing to switch sides and change their allegiances), and the smaller players including Indio’s gang, as well as Calloway and Cavanagh. These relationships are visually traced through the film’s (in)famous motif of cuts between extreme close-ups of different characters eyes, first established in the rapid back-and-forth editing of Mortimer’s first look at the wanted poster for Indio. In the final shootout alone, we see Mortimer looking at Indio, Indio looking at Mortimer, No Name looking at Indio looking at Mortimer, and No Name looking at looking at Mortimer looking at Indio (each gaze gets its own individual sequence of cuts). The death on which this monetization of life relies is held back by these connections. This society is explicitly defined not only as proto-capitalist, but also as predominantly masculine. There are exactly three women in the film, and each is constructed (and credited) as a possession of their respective male counterpart ("Calloway’s girl," "hotel manager’s wife," and "Mortimer’s sister"). Far from indicating some sort of inherent sexism, this is simply a sign that we’re dealing with issues of masculinity in a primarily male society. Interpersonal relations here are relations among men. But unlike Eve Sedgwik’s original formulation of homosociality (relations among men without explicit sexual or romantic connotations), these relationships are mediated not only by women but also—and in this case more importantly—by bullets and by money. At No Name and Mortimer’s first in-person meeting, they each take turns repeatedly shooting each other’s hats, after which they become friends (the encounter is followed directly by a shot of their two hats together on a table). These are relationships based primarily on showmanship: there’s no other purpose to shooting each other’s hats (neither of them means any harm), they’re merely amicably trading bullets. This seems to be the sign of true friendship in male society: shooting at someone and not killing them. Or at least not taking money for killing them. El Indio’s name reminds me how much I love that Spaghetti westerns do away with the inherent racism of the western genre by basically eliminating their existence entirely. "El Indio" means "the Indian," but there are no indians in the movie—or at least no Native Americans. I think it’s possible to read this as an even worse racism (the erasure of the Native American experience), but to me it reads more like the transposition of the western genre into an Italian context (which obviously excludes the existence of Native Americans because it no longer takes place in America).